Sometimes I do get too excited about food. OK, perhaps it’s not sometimes. Maybe it’s more frequent than sometimes…Normally, my excitement ends up in me buying a whole aisle or two of stuff (not literally, but you know what I mean, right? Right?). The other day, I saw cute watermelons in the supermarket. Oh, yes please! Hmmm…will one be enough? They do look quite small (that’s why they are soooo cute!). Perhaps I should take two. Yes, two sounds good. But then…I guess that’s only one each (even knowing that my other half doesn’t eat watermelon, but hey, it makes me feel sooo much better when I try to talk myself into things! )…OK, three it is. Plenty for fruit salads and smoothies/ juices, perhaps even a cheeky melon punch inside of the melon? Yup, three is a magic number. Add another two cantaloupe melons, and you are one step away from melon overdose (but ohhh, so happy!). So to create some space in my fridge, I decided to start with this smoothie, salads and punch followed later on. 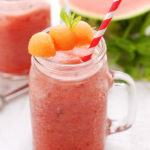 It was actually more like a juice, due to using water and melons themselves contain a lot of it, as we all know, so the consistency is definitely not as thick as your usual smoothie, but just as good. Addition of lime and mint gives it really refreshing taste, the one that makes you wanna go ‘ahhhhhhhhhhhhhhhhhh’ after sipping on it. Hope you will like it as much as I do. 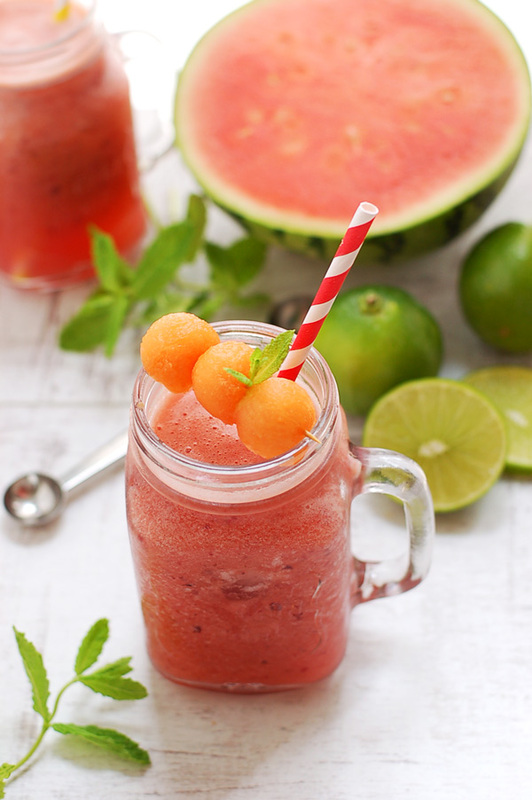 Super refreshing smoothie made with cantaloupe, watermelon and mint with lime. The quickest way to hydrate yourself! 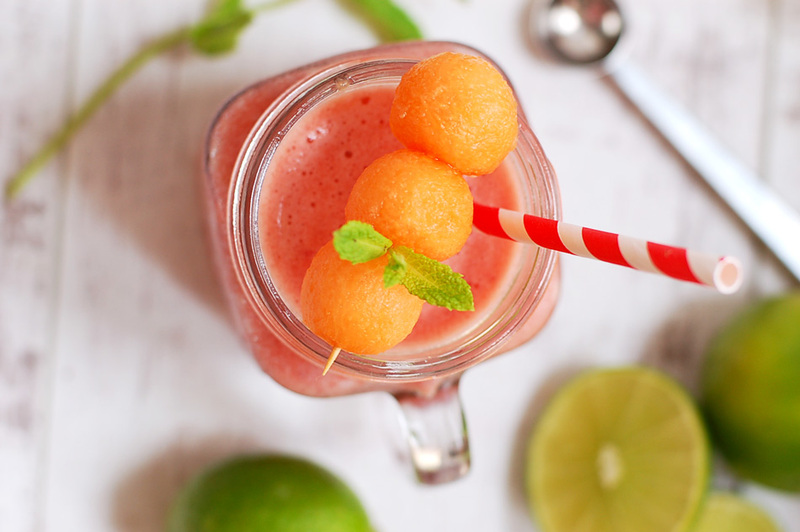 Blend all the ingredients together in a powerful blender and pour into glass/ jar filled with ice cubes. 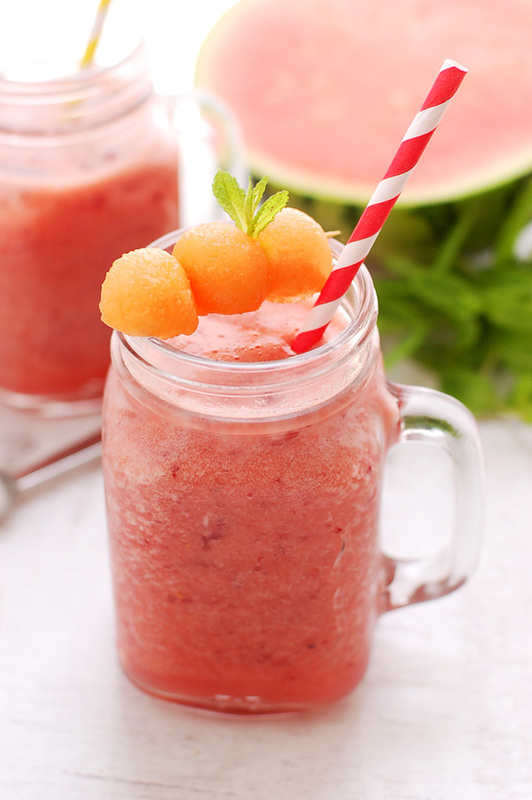 Decorate with fresh mint leaves and melon.